Every year Reserve Bank of India (RBI) conducts RBI Grade B 2018 Officer Exam to select eligible candidates for the position of Grade B officer in its various branches all across the country. As Reserve Bank of India offers an excellent pay scale and reputed job profile, it lures thousands of candidates every year to take this examination. With a handful of vacancy to be filled through RBI Grade B Exam, it is really important to prepare effectively for this exam. Selection for RBI Grade B Officers will be done through a country-wide competitive Examination in three phases i.e. Preliminary and Main examination followed by an Interview. Reserve Bank of India (RBI) has released the recruitment notification for the post of RBI Grade B Officer on 3rd July 2018. 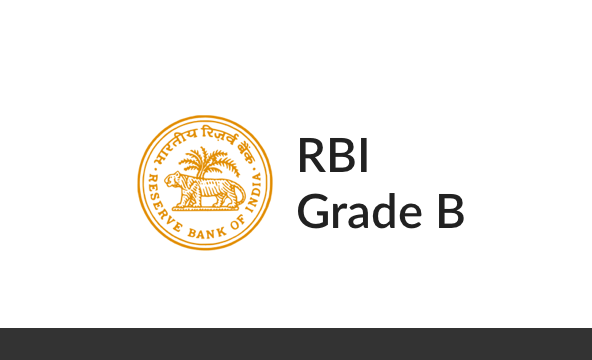 RBI Grade B 2018 exam has a three phase selection process. RBI Grade-B Officer Phase-I Exam is scheduled on 16th August 2018 and Phase-II will be conducted on 07th September 2018. Candidates who get selected after Phase-II of the exam are called for the final interview process. The online application for RBI Grade B 2018 exam will start from 03rd July and the closing date is 23rd July 2018. Reserve Bank of India (RBI) has introduced 166 Vacancies for 2018 RBI Grade B Exam. Let's have a look at the tentative vacancy for RBI Grade B 2018 Exam. All the Officers selected through RBI Grade B 2018 Exam will be given the annual salary of 12-14 Lac. Along with this CTC comes numerous emoluments and perks. The Pay Scale for the RBI grade B Officer is Rs. 35150-1750(9)-50900-EB-1750(2)-54400-2000(4)-62400. This means that you will be having basic pay of Rs. 35,150/- in which you will get an increment of Rs. 1,750/- up till nine years of your service. After the completion of nine years you will get into the executive band wherein the basic pay will be of Rs. 50,900/- and then again for the next two years you will get an increment of Rs. 1,750/- and further an increment of rs. 2000/- for the following 2 years thus ending up with the basic pay of Rs. 62,400/- and this is when you don't get any promotion. Apart from the Basic Pay, multiple emoluments such as Dearness Allowance, House Rent Allowance, Family Allowance, Telephone Allowance, Conveyance Allowance etc. will also be provided. Keeping in mind the RBI GRADE B 2018, we are launching various Test Series, Classroom Programs and Seminars to guide you through your preparations. The online application for RBI Grade B 2018 exam has started from 03rd July and the closing date is 23rd July 2018.